The character of Theodore Roosevelt, as played by Don Moon, was developed as part of an advertising plan by one of Colorado most historic hotels. 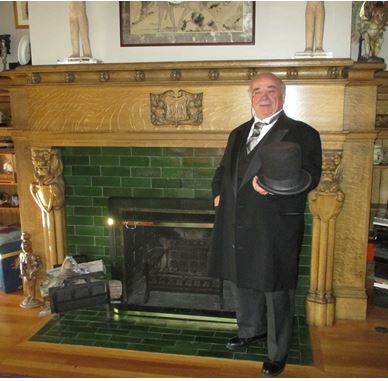 Don’s portrayal of Roosevelt took off and he has been part of many public and private events including the ground breaking of several public buildings and the opening of a time capsule from 1901 at Colorado College. The portrayal of Theodore Roosevelt takes on two areas of his life, his personal life and his political and civic life. T.R. was fascinated by the natural world and man’s involvement in it. He wanted to be a natural scientist and studied nature at his home in New York as a youth. His time in the wilderness, after his wife and mother died, was a watershed time in the development of his love of this country and it wonders. Roosevelt was a consummate politician and had been schooled by his parents to be a leader. His skills, sharpened by Harvard and his experiences in the west, urged him on to a life of service. Don Moon is a Colorado native with roots that go back to the turn of the last century when his grandparents came to Colorado in a covered wagon and homesteaded 160 acres along the lower Arkansas River. He was raised in Pueblo and settled in Colorado Springs when he returned from 19 months in Viet Nam. The Pikes Peak Historical Society invites you to learn more about Theodore Roosevelt at the PPHS monthly Chautauqua on Sunday, August 12th at 2pm at the Florissant Library. The Library is located adjacent to the Florissant Community Park on 334 Circle Drive in Florissant. This program is presented as a public service of the Pikes Peak Historical Society in partnership with the Rampart Library District. Admission is free and refreshments are served. No reservation is required but arrive early, seating is limited. For more information call 719-748-8259 or 719-748-3861.